Canada’s Porter Airlines, headquartered at Billy Bishop Airport in Toronto, announced Monday, that it is adding its first Florida destination- Melbourne. The airline, that is an award-winning air carrier, said it enters the Florida market for the first time and it has selected Melbourne International Airport for its first destination in the Sunshine State. The flights to Melbourne International Airport (MEL) will be seasonal. The weekly service begins December 19 and initially will run through April 30, 2016. Porter Airlines will fly one round-trip flight each Saturday between Melbourne International Airport and its main base at the Billy Bishop Toronto City Airport, which is located near the city’s financial district. The carrier will offer connections via Toronto to seven other Canadian cities: Montreal, Ottawa, Sudbury, Thunder Bay, Sault Ste. Marie, Timmins and Windsor. The route is significant for the aircraft carrier. Melbourne will become Porter’s first destination in Florida for the last nine years. Melbourne is expected to become one of the top leisure markets for Canadian travelers. Robert Deluce, president and chief executive officer Porter Airlines said that “many Canadians want to escape during the winter season” so including Central Florida as a seasonal service is a great opportunity for the carrier to meet its customers requests. The carrier is targeting the popular Central Florida market because of the millions of tourists willing to visit the beaches, take a cruise from Port Canaveral and, of course, go to the theme parks in Orlando. The Toronto-Melbourne route will become Porter’s longest route, surpassing its seasonal run between Toronto and Myrtle Beach, S.C. The airline will fly approximately 1,070-mile route to Florida with Bombardier Q400 aircrafts which currently are the only aircraft type in Porter’s fleet. 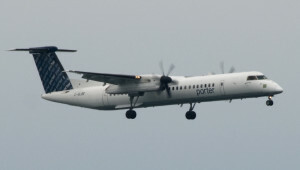 The Bombardier Q400 seats 74 passengers, but only 50 seats are planned to be sold on the Toronto-Melbourne route, due to “fuel and range considerations.” The flight is scheduled for 3 hours, 10 minutes in each direction, according to Porter’s website. Introductory round trip prices will start at $330.